Sathiguru Maharaj speaking to the Yogis, the Yogis said to Sathiguru jee, they said to Guru Nanak Devjee Maharaj, Maharaj we live within marree – the little monasteries, the little temples what is Your monastery? What is Your temple? What is Your place in which you sit? Sathiguru Nanak Devjee Maharaj said aouhathhasath marree ghar shaaeiaa – my marree: marree also means a place which is built in remembrance of a holy figure. Guru Sahibjee says that aouhath – hath means this heart, opening up my heart, having the Lord dwelling within my heart is myhasath marree – is my true abode, is my true temple, is my true monastery – my heart. Ghar shaaeiaa – within each house, within each human being, within each heart shaaeiaa – that Waheguru is pervading through. Dharangagan kal dhaaree – that Waheguru, His kal – His power is dhaaree – is what brought into creation and what is infused in the dharan – the earth and the gagan – the sky. Sathiguru Maharaj sahibjee is explaining O Yogi, O hermit you may be talking of external marrees, external mausoleum but within me there is a Light – that Light is housed within the mausoleum – within the temple, within the monastery of my heart. Dharan gagan kal dhaaree – Sathiguru Maharaj sahibjee is explaining to us that the kal – the power of Waheguru is pervading through the dharan – the consciousness and the gagan – the space within us. Guru sahibjee gives us the crux – the center point of the shabad. Guru sahibjee says, O santhahu – O saints of the world, Guramukh – following the mukhi Guru – the primal Guru – the Sathiguru – Eternal Guru, kaethee – countless have been oudhaaree – have been liberated through the shabad. Guru Sahibjee is explaining to us that the Yoga in Guru's house is that of the shabad, union is only through the shabad in the house of Guru Nanak. Sathiguru Nanak Devjee Maharaj is explaining this to those hermits. Guru Maharaj jee says rehaao - pause and think about this. Those Guramukhs who follow the primal Guru, the Eternal Sathiguru they maar – they conquer, they remove all of their mamathaa – all of their attachment to this world. Houmaisokhai – their houmai – their egotism is sokhai – is removed. Thribavan joth tumaaree – they see thumaaree – Your Light O God, Your joth pervading through thribavan – all of the universe, all three worlds: the nether regions, the skies and this earth – pervading through all. Guru Sahibjee says if you want to see this, what do you have to do? You have to mamathaa maar – you have to kill your attachments, conquer your attachments and houmai sokhai – eradicate your ego and then you will see that Light which pervades through all. The sinngee which plays within the Guramukh, Guru sahibjee says the horn which plays within the Guramukh is the anaahadh – is the never ending sound, the never ending beat of the shabad, the Words of the Guru, the Eternal Words of the Guru. That plays where? - Within the surath – within the consciousness of the Guru-centered being. Ghatt ghatt joth thumaaree – tuning into this Eternal mantra of the Guru – the shabad of the Guru, what happens? When the Guramukh – the Guru-centered being completely focuses his/her attention upon the shabad, upon the Words of the Guru ghattghatt – within each heart they see thumaaree – the Light – the joth of thumaaree – of You O Lord pervading through all. That Waheguru who is mil – who is pervading through panch thath - the five elements and ahinis – who is the everlasting day and night, the one who can never be extinguished, dheepak – Light of the whole world. Niramaljoth apaaree – His joth – His Light is pure, niramal - beyond any filth, apaaree – is never ending. Sathiguru Sahibjee says the Guramukh – the Guru-centered being takes, mil meaning to take, the virtues of the panch thath – the five elements into His life. What is that? 1. The virtue of earth being forgiveness 2. The virtue of water being purity 3. The virtue of fire being the Light of wisdom 4. The virtue of air being un-attachment 5. The virtue of space being to pervade through all. He takes these five virtues into his life – the Guramukh; the Guru-centered being. Ahinisdheepak – day and night, within him burns the dheepak - the candle of the spiritual wisdom of the Guru. Niramal joth apaaree – through this he comes to see the apaaree – the infinite joth which is niramal – the Infinite Light which is ever purifying of God pervading through all. Guru Sahibjee says that Waheguru jee's loukae – the two channels are the rav – the sun and sas – the moon. Eihu than kinguree – than here means whole expanse of universe; the whole of the universe is Waheguru jee's kinguree – Waheguru jee's harp. The sun and the moon are His channels, this whole universe is His harp. Vaajai – it is being played through the sabadh – that Eternal vibration of the Guru's shabad – of Waheguru jee's Words which are niraaree – pervading through all but still separate from all, niraaree – meaning to be unattached. That sabadh is playing through all, that constant vibration of Oankaar is pervading through all yet it is not dirtied or sullied by this world. It does not die when we die. It is not born when we are born. It is beyond that. It is ajoonee – beyond birth and death. When the Yogis ask where is Your aasan? Where is Your seat, where is that place where You meditate? Guru Sahibjee says Siv nagaree – siv meaning the highest, nagaree meaning abode: our highest abode. What is Guru sahibjee talking about? – the Saadhsangat. In the saadhsangat – that is where my aasan is, my seat of meditation is O aoudhoo – O hermit. 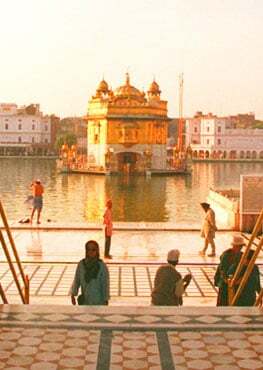 Siv nagaree – meaning in the nagaree – in the city of Siv – doesn't stand for a demi-god here, Siv meaning Akaal Purakh Waheguru, that One Lord God Waheguru. That Lord God who is pervading through me, meditating upon Him, joining with Him into His abode, that is my aasan – that is my seat. Alakh aganm apaaree – Waheguru jee is alakh – beyond the thoughts of this mind, aganm – beyond our senses and apaaree – infinite. This kaaeiaa – this body is the nagaree – is the city. Eihu man – our mind is the raajaa – is the king. Those Guramukhpiaare who are panch – meaning purified, meaning those who meditate upon the Lord. Vasehi veechaaree – they live their lives with their mind under control and with veechaaree – the understanding of Guru's Wisdom. Kaaeiaa nagaree - this body is the nagaree – is the city and eihu man raajaa – is the king. Panch vasehi veechaaree – there are panch – there are five giaan indarae – there are five organs through which we receive knowledge of the world. What are they? 1. Eyes with which we see 2. Ears with which we hear 3. Nose with which we smell 4. Tongue with which we taste 5. Skin with which we feel The Guramukh piaare – they have conquered this mind and therefore they control all five of these senses. They sit within this aasan of the mind, within their hearts and they ravai – they imbue themselves with the sabadh – with the Words of the Guru. Into their house comes the raajaa – the king – the Lord God Waheguru. adhal karae gunakaaree – then He deals our justice; gunakaaree and He blesses them with virtue. What can the bapurae – poor, kaal meaning death,bikaal meaning birth. What can death and birth say to the Guramukh – Guru-centered being who has jeevath mooaa – died whilst being alive. What does that mean? To have these eyes, ears – all of these senses under control, to have killed the ego, to have defeated desires, to have defeated anger. Man maaree – who has conquered his mind. Maharaj sahibjee says that the world says that Brehamaa is the creator, Vishanu is the preserver and Shiv is the destroyer but Guru Shaibjee says, No! there is only eik moorath – there is only One Waheguru jee who controls all. Sarab paalak sarab ghaalak sarab ko pun kaal as Guru Gobind Singhjee says in Jaap Sahib: Waheguru is the One who creates, nourishes and destroys. That Brehamaa,Vishnu and Shiva – they all work with His Light. If His Light wasn't pervading through them they wouldn't work without Him. He is the One who pervades through all, eik moorath – He is only One. Aapae karathaa kaaree – He is the One who creates and kaaree – carries out all. What is the way of tharai – from being liberated from this saagar – from this ocean of fear? Guru Sahibjee says kaaeiaa sodh – search within yourself, purify your kaaeiaa – your spiritual body within, kick out desire, anger, greed – all of these things. Aatham thath veechaaree – meditate upon the essence of your aathama – which is Lord God Waheguru. The Yogis ask where can we get sadhaa sukh – Eternal peace and Guru Sahibjee answers gur saevaa – serve the Guru and then you will paaeiaa – find Eternal peace. How is this possible the Yogis say? Anthar sabadh raviaa gunakaaree – Guru and sabadh will come to abide within you, anthar meaning within you and gunakaaree – it will bless you with all virtues. Those who have been mael – united aapae - by Waheguru jee Himself, the gunadhaathaa – the giver of all virtues, houmai thrisanaa maaree – Waheguru jee has maaree – has eradicated their houmai – their egotism and their thrisanaa – their fire of desires. – have been eradicated. What are the three qualities? 3. Sukhopath – state of deep sleep where there are no dreams. – the most pure way of bhagti – of devotion. The Yoga of the Guramukh – of the Guru-centered being is to cheenai – is to recognize his aatham – his/her True Self through the sabadh – through the Words of the Guru. Hiradhai eaek muraaree – through the Guru's Words they come to understand that that muraaree – that Lord God Waheguru is One, is eaek and is abiding within their hiradhai – their heart. How do we make this mind stable? Guru Sahibjee says manooaa asathir sabadhae raathaa – your mind will become stable if you raathaa – if you imbue it within the sabadh – within the Words of the Guru. Eaehaa karanee saaree – Sathiguru Sahibjee says this karanee – this action is saaree – is the most perfect of all. Guru Sahibjee says O aoudhoo – O hermit, O saint of the Lord, O seeker of the Lord do not engage in baadh. Baadh meaning arguments, not a civilized debate where you listen to the other side, baadh just means a shouting match. Guru sahibjee says do not take part in these shouting matches. Which saint are they talking about, baedh – spiritual wisdom, because it's not? N paakhandd – do not engage in false show of rituals, O oudhoo – O hermit. Guramukhsabadh beechaaree – instead center yourself on the Guru and beechaaree – contemplate the sabadh – the Words of the Guru. O hermit, O aoudhoo the Guru-centered being in this way kamaavai – practices Jog – complete union with the Lord. Jath sath sabadh veechaaree – how is union achieved? Through keeping jath – celibacy, meaning to keep your desires restrained, sath meaning completely abiding to the truth, sabadhveechaaree – by meditating upon the sabadh – by meditating upon the Words of the Guru. When Maharaj Sahibjee talks about jath here, Maharaj sahibjee is not saying that we must all abstain from marriage, Guru Sahibjee is saying that we must abstain from desires. We can be married, we can live in this world as householders but even as householders we must keep our desires under control. Through the sabadh we can maarae – we can truly die, we can truly kill our ego, our sense of self, our sense of desire, man maarae – this is the way of conquering your mind O aoudhoo – O hermit. Jog jugath veehcaaree – this is the true method of jog - of union, veechaaree – come and understand this. O avadhoo – O hermit this mohu – this attachment to maaeiaa – to illusion of the world is an ocean of fear, this is where all fear comes from. Guru Sahibjee is telling us that all fear comes from attachment to this world. What do we fear? That we are going to lose something. Guru sahibjee says that if you lose that sense of attachment then you've lost all fear. Sabadh tharai kul thaaree – if you tharai – if you are liberated through the sabadh – through the Words of the Guru kul thaaree – you will save your family. What does that mean? All those around you – you'll effect them. O aoudhoo – O hermit the sabadh – the Word of the Guru is the true soor – the true warrior, is the true liberator in jug chaarae – in all of the ages, in all four of these ages: Satjug,Threta, Duaapar and Kaljug are the names of the four ages. Guru Sahibjee says the greatest hero – the greatest warrior is the sabadh – is the Word of the Guru. Another meaning sabadh soor – soor means sun, the true sun – the true Light of the world is the sabadh – is the Word of the Guru jug chaarae – that sun has been lit since time beyond creation, jug chaarae aoudhoo – O hermit. Baanee bhagath veechaaree – you can come to understand this as a bhagath – as a devotee through the baanee – through the Words of the Guru. O hermit this man – this mind is mohiaa – is attached to this world, to this illusion, nikasai sabadh veechaaree – but the way of breaking through this cage of entanglement, nikasai means to escape, the way of escape is through veechaaree – through contemplating Words of the Guru, meditating upon them, reciting them, understanding them, realizing them throughout your life. Waheguru jee Himself bakhasae – forgives us. Mael milaaeae – unites us. He sits in the Guru and forgives our sins and unites us with Akaal Purakh. He is the One who is sitting within the Guru: Sathigur vich aap rakhioun – aasaa kee vaar tells us the Lord God is within the Eternal Guru, within the true Guru, within Siri Guru Granth Sahibjee. Waheguru jee Himself is in the form of Siri Guru Granth Sahibjee uniting us to that formless Lord. Nanak saran thumaaree – Sathiguru Nanak Devjee Maharaj says I've come into the protection of the Guru and therefore the protection of Akaal Purakh, of Lord God. Guru Maharaj is saying to us become true Yogis, become true hermits and what is the way of doing this? Guru Sahibjee tells us: guramukh kaethee sabadh oudhaaree santhahu – O saints center yourself upon the Guru because by centering oneself upon the Guru and focusing upon the Words of the Guru countless have been saved and countless will be saved in the future.